How high can you go? That’s the question you’re going to answer when you get started with Doodle Jump. As the Doodler, a lone bouncy alien-like figure living on a sheet of graph paper, it is your mission and your purpose in life to travel as vertically far as you possibly can. What will you see? You’ll find a lot of power-ups for one thing. There are all sorts of goodies that can help you ascend higher. However, there are also a lot of hazards, obstacles and enemies who will do everything they can to knock you down or otherwise end your journey early. If you can weave around them and think on your bouncing feet, then maybe one day you’ll reach the top of the paper. 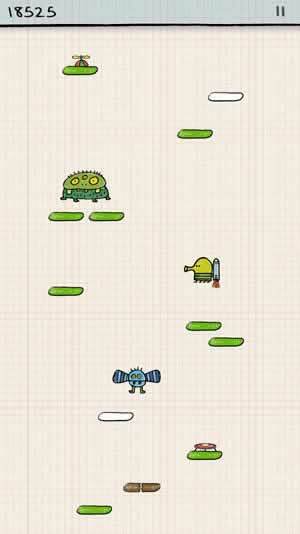 The gameplay of Doodle Jump could not be any simpler. As the Doodler, you must jump, bounce and hop as far up the level as humanly possible. See what kind of vertical distance you can make before you meet you untimely end. Tilt your device to the left and right to steer the Doodler and determine where he will hop. Land on top of platforms to keep bouncing and hopefully ascend higher. Stay on your feet. Some platforms are stationary, while other move. Includes a myriad of different themes. Play on the original doodled graph paper, in outer space, in the rain forest, in an icy blizzard, to the holidays, and more. Features never-ending platforming action. Jump higher and higher for as long as you want. Record the score for your longest runs. Play again and beat your previous record. Although you’ll have to depend on your toes more than anything, there are all sorts of neat little treasures that’ll ease your jumping abilities like no other. Grab the power ups to go where no other Doodler has gone before. Hop on top of springs and trampolines to bounce even higher into the air. Grab a propeller hat or jetpack to fly really high. Increase your jump height with the spring shoes. Use the shield to protect yourself from enemy attacks. 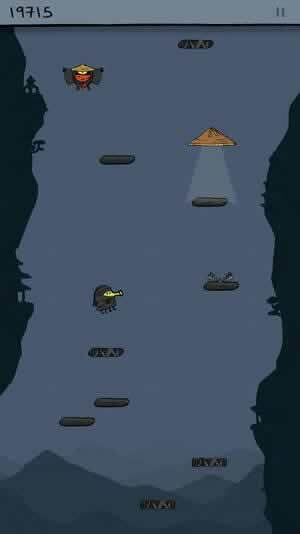 Even the world of Doodle Jump is filled with its own set of dangers. It is imperative that you avoid them, unless you want to turn your game of Doodle Jump into Doodle Fall. Beware of all sorts of monsters. Shoot them with your laser or jump on top of them to get them out of your way. Avoid broken red platforms; they’ll collapse under your weight and send you back to the ground. Give black holes a wide berth, or else you’ll fall into a whole other reality. Don’t get abducted by UFOs! 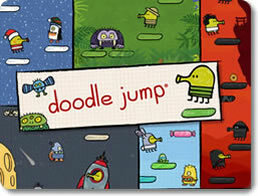 Doodle Jump may be simple in concept, but it’s hard to put down. With cute visuals, fun power-ups, and endless platforming action, the game offers an old-school arcade experience for the new frontier of mobile gaming. If that sounds appealing, then jump on the bandwagon with the Doodler and hop your way to glory today!